Our new paper was published in ISME journal. We showed that the possession or alternatively the lack of PR genes reflects one of two fundamental adaptive strategies in marine bacteria. 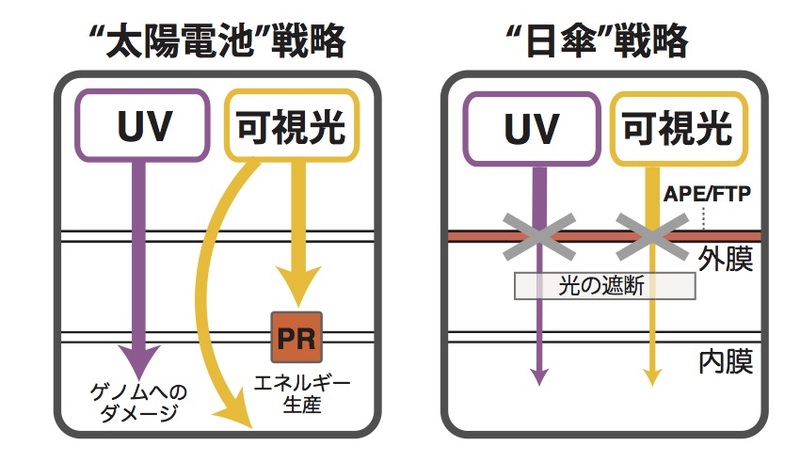 Specifically, while PR-possessing bacteria utilize light energy (“solar-panel strategy”), PR-lacking bacteria exclusively possess UV-screening pigment synthesis genes to avoid UV damage and would adapt to microaerobic environment (“parasol strategy”), which also helps explain why PR-possessing bacteria have smaller genomes than those of PR-lacking bacteria. Collectively, our results highlight the different strategies of dealing with light, DNA repair, and oxygen availability that relate to the presence or absence of PR phototrophy. For the details, please see this link.